For other uses, see São Nicolau (disambiguation). 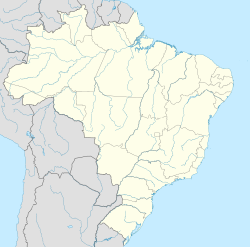 São Nicolau (Portuguese meaning Saint Nicholas) is a municipality of the state of Rio Grande do Sul, Brazil. The population is 5,732 (2015 est.) in an area of 485.32 km². It is located 562 km west of the state capital of Porto Alegre, northeast of Alegrete. The Uruguay River, which forms the border with Argentina, flows along the northwestern part of the municipality. The municipality would be partially flooded by the proposed Garabí Dam. This page was last edited on 16 March 2018, at 23:23 (UTC).